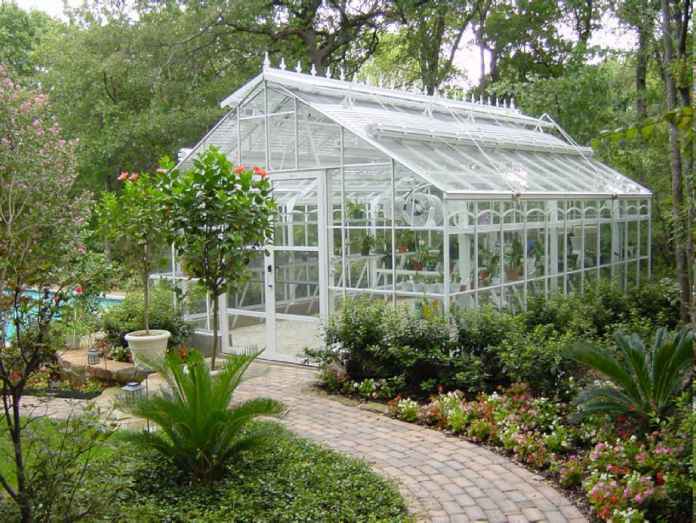 For optimal growth to take place, the nutrient concentration and pH must be consistently balanced over time to insure plants have what they need, when they need it. In any circulating hydroponic system, with every pass the nutrient makes past the root system, an exchange is taking place. As a result, as time goes by, your nutrient solution changes in concentration. Therefore, so does each plant's ability to uptake essential elements. The easiest way to keep on top of your nutrient solution is to take a measurement of PPM or TDS (Parts Per Million and Total Dissolved Solids). This measurement is also commonly referred to as the EC or the "Electrical Conductivity" of a solution, because that is actually what you are measuring. There are a number of methods of measuring PPM. My favorite is the digital PPM meter that is submerged in the nutrient solution for a reading to be taken. Digital PPM meters are calibrated using a solution that has a known PPM value and you must calibrate them every so often. But nothing beats their convenience. Frequent nutrient solution changes will generally keep the concentration where it needs to be. My best advice is to carefully follow the directions that come with the nutrient you plan to use. This simple liquid pH test and control kit will enable you to maintain the pH of your nutrient solution inexpensively and with ease. All the nutrients in the world will not do a plant any good if it cannot absorb them easily. A major factor in determining a plant's ability to uptake nutrients is the relative acidity, or pH (the negative log of the hydronium ion concentration) of the soil or solution from which they feed. pH is taken by measuring a voltage (potential) in a solution and registering it on a scale of 0-14 that represents the concentration of hydronium ions in solution. Generally, it is used to determine whether a solution is acidic or basic. If your pH reading registers a 1 on the scale, this represents a high hydronium ion concentration (an acid). Pure water is considered neutral at a pH of 7. A 14 on the scale represents the lowest concentration of hydronium ions (basic, alkaline). When adjusting pH, it is best to give your fresh nutrient mixture several hours to stabilize before attempting to adjust it. You should also be aware that commonly available pH control products are very powerful, and a little bit too much can sacrifice your entire nutrient solution fast. For first timers, I would even suggest mixing up a single gallon of nutrient solution, letting it sit for a day, and then counting how many DROPS of pH adjustment (up or down) it takes to get it to a range of 6.0 to 6.5. You can then multiply your count by the volume of your reservoir as a baseline for rapid, full reservoir adjustments. 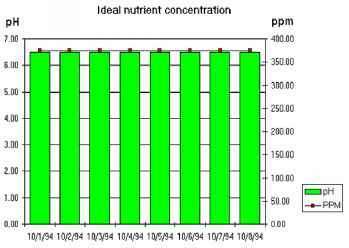 Some nutrients may become unavailable to the plant if the solution pH drifts from an optimal reading, which for most plants is between 6.0 and 6.5. This condition is called "nutrient lockout". pH can be tested with litmus paper and adjusted with an inexpensive pH control kit. Follow directions on product packaging. Since pH and PPM generally share an inversely proportional relationship, by measuring pH, you can sometimes infer what's happening to the concentration of your nutrient solution. These charts attempt to illustrate this principle. 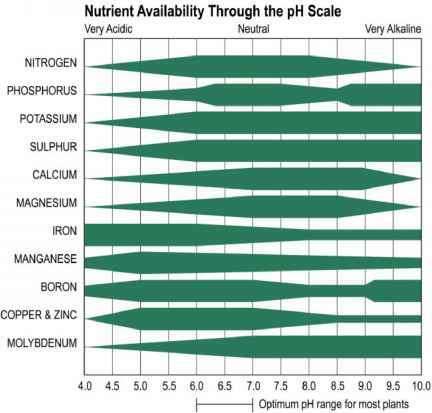 In this example a perfect balance exists between plant requirements, solution pH and nutrient concentration. This is exemplified by steady readings in both PPM and pH over time. Naturally the volume of nutrient solution decreases over time, however, that is not indicated here... Your goal is to deliver exactly what the plant requires - no more -no less - temperature and light intensity play a major role in determining this balance. 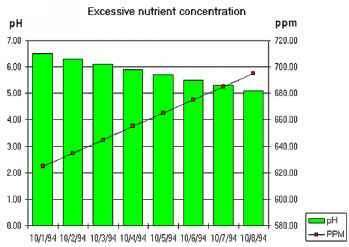 The crop is consuming more nutrient than water, note the PPM decrease. Since most nutrient solutions have a pH buffer which tends to pull down the pH, the decrease in concentration results in the rise of pH. Many times what you may observe to be a nutrient deficiency i.e. : yellowing older leaves, red petioles and stems, may actually be caused by an excess of nutrient or unhappy pH - be sure to use that pH and PPM test kit and meter! Here the plants leave excess nutrient behind. 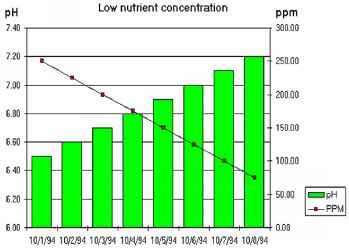 This imbalance causes PPM to increase, effectively decreasing pH, causing nutrient lockout. Possible causes are high heat/intense light which will increase the plant's transpiration of water as the plants "sweat". Diagnosis of these problems is important. Once you get into a routine with a particular crop and growing environment, you will develop a knack for what should and should not be, making this seemingly complex process simple. Keep a log and LEARN! How to make a hydroponic nutrient solution with a ph buffer? Where can i buy litmus paper? What makes ph rise nutrient solution? 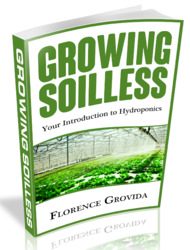 How does a ph imbalance in hydroponic solution cause nutrient deficiency? How to stabilize nutrient ph? How to manage p.h ion a hydroponic system? How to stop nutrient lockout? How to adjust ppm and ph in hydroponics? What causes ppms to rise? What causes ppm to rise in hydroponic systems? How to calibrate the nutrients in a hydroponic system? What causes hydro ppm to rise? How to check consentration level in hydrponices?